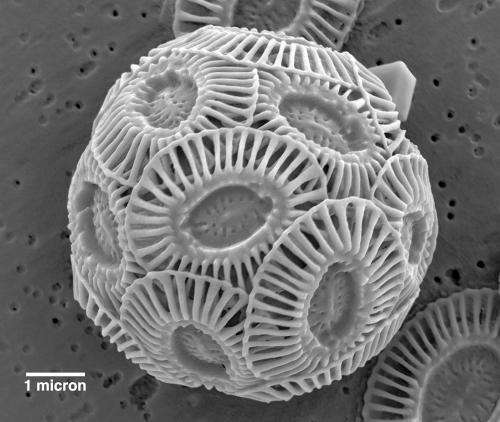 A year-long experiment on tiny ocean organisms called coccolithophores suggests that the single-celled algae may still be able to grow their calcified shells even as oceans grow warmer and more acidic in Earth's near future. The study by the RTC scientists was supported by the National Science Foundation and published in the August 26 issue of the Philosophical Transactions of the Royal Society B. We worry about CO2 and it's nice to know some organisms can adapt to a changing climate, but... as long as we destroy sequestering ecosystems by our misuse of the land... CO2 the symptom of climate change will create conditions we must adapt to face as well. Now if we can just ensure that the wheat producing areas of the USA dont loose 2" precipitation, things will look just peachy, If we can figure out how to plow and harvest sans Oil. Uncle Sam is desperate to preserve his world in formaldehyde. Club of Rome says "Not a chance." Confusius says. "Impermanence and Eternity." Sure. Problem is if just one rung of the food chain doesn't cope with climate change it won't matter (for us) what the others do. We'll be screwed. Good Job. I will now add this to my "everything is going to be alright" Bookmarks folder. It's not all that rosie. "the same SF State researchers found that the same strain of coccolithophores grown for hundreds of generations under cool and acidified water conditions grew less shell than those growing under current ocean conditions." Humm... solubility increases with temperature, I wonder how the little coccolithophores would survive HOT acid?